Aim to lose a pound or two per week. 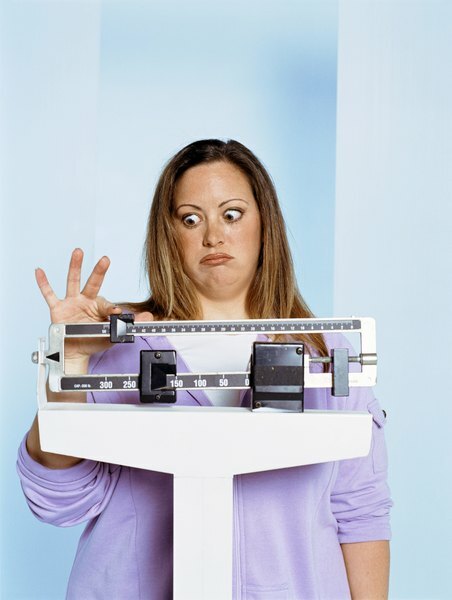 About 64 percent of women in the United States are overweight or obese, the U.S. Department of Agriculture reports. Unless you’re more than 6 feet tall or extremely muscular, if you’re a woman who weighs 180 pounds, you are too heavy, notes the University of Washington. Calorie reduction is effective for weight loss in overweight and obese women. Following a 1,400-calorie meal plan can help most women who weigh 180 pounds lose weight. The U.S. Department of Agriculture provides a free, 1,400-calorie meal plan that includes 1.5 cups of vegetables, 1.5 cups of fruits, 4 ounces of protein, 5 ounces of grains, 2.5 cups of dairy products, 4 teaspoons of oil and 120 extra calories each day. High-protein foods include eggs, poultry, seafood, meat, soy products, seitan, nuts and seeds. A 1,400-calorie weight loss diet for a woman who weighs 180 pounds may include one large scrambled egg prepared with one-half ounce of reduced-fat, cheddar cheese, 1 cup of oatmeal, 1/4 cup of raisins and 1 cup of skim milk for breakfast plus a morning snack of a half-ounce of almonds and one small apple. For lunch, she could have 2 ounces of grilled chicken breast, 1 cup of brown rice, 1 teaspoon of olive oil and 1 cup of steamed broccoli. Her afternoon snack could be a cup of plain, Greek yogurt. For dinner, she could eat 2 ounces of grilled tilapia, 1 teaspoon of olive oil, a half-cup of roasted potatoes, 1 cup of salad greens and 1 tablespoon of ranch salad dressing. This menu provides 1,420 calories, 187 grams of carbohydrates, 96 grams of protein and 36 grams of fat, according to the USDA Super Tracker. The more active you are, the more calories you need to avoid feeling hungry on a weight-loss diet. The 2008 Physical Activity Guidelines for Americans recommends that all adults engage in at least 150 minutes of moderate-intensity aerobic exercise each week. MayoClinic.com reports that although exercise is important, calorie restriction is your most effective tool for weight loss. 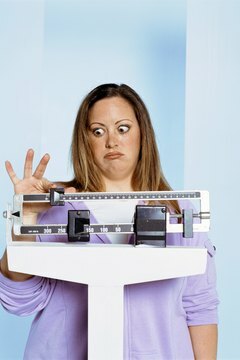 MayoClinic.com: Which is Better for Weight Loss — Cutting Calories or Increasing Exercise?